Request a Media Kit and Book | Author Available for Interview! (Cade, Louisiana)—Have you had a cup of tea since teatime? Well, it’s time for tea! Tootle Time Publishing Co. announces the release of its third title in the Mr. Tootles teatime series—Mr. Tootles and the Giggle Wiggles by Maryceleste Clement, with Paul Schexnayder’s colorful illustrations. Both kids and parents enjoy the fun, whimsical, rhyming stories about the silly things that always happen during teatime with Mr. Tootles. In this new book, all the wiggling around of the other guests—Willie and Max, Spot the dog and Kitty Cat—baffles Mrs. Bea, a regular guest at tea. Even the teacups are wiggling! By the time teatime ends, Mrs. Bea is wiggling her fingers and toes, and having a ball just like her friends. In all the Tootle Time books there is a “signature” pattern of red checkerboard that can be found on every two-page spread. Kids love to search and find this pattern no matter how big or small it is. Maryceleste maintains that a great children’s book should be fun to read, have bright, vivid illustrations and create a special magic for children. Whether being read at bedtime or as part of an event like a kid’s tea party, kids will connect with the whacky characters and their antics. Children everywhere are joining the Tootle-Mania craze! Published by Tootle Time Publishing Co.
Maryceleste Clement lives an interesting and slightly madcap life. She splits her professional time between the management of the family’s oilfield business, The Clement Companies, and her personal computer where she enjoys writing a series of books for children that follow the adventures of Mr. Tootles and his teatime frolics. Maryceleste is definitely a Louisiana girl. She was born in New Iberia and she graduated from the University of Southwestern Louisiana in Lafayette. And Tootling around the countryside, seems to be what Maryceleste likes best—especially if she is with her family: her husband Tim and her two children, Tyler and Sarah-Ashley. Mr. Tootles shares a special bond with both his creator and illustrator. The author has often thought that is it not just seeing the glass of life as either half empty or half full, it is important to consider what is in the glass. For her, the glass is not full of trials and tribulations, but rather of amusements and adventures. Mr. Tootles shares this philosophy, reminding us that we simply can’t take everything so very seriously. Maryceleste would like to think that she took a special part of herself and created him. And, as she was talking to the Paul Schexnayder, the illustrator, brainstorming about the character of Mr. Tootles over a drawing pad and a cup of tea, his sketches more and more began to resemble the artist himself. When she created Mr. Tootles, she knew he was an English gentleman who had silly adventures during tea-time with his friends. She had a good visual picture of this kooky character. She knew he wore an English hat, a dark suit, and glasses and had a long, slim face. For Maryceleste, a writer to whom lots of silly and unusual things always seem to happen in the amidst of being a hard working grown-up with lots of responsibilities, she reminds us it is okay to be kooky and different. It never failed. Something funny, silly, different and yes, crazy always happened. She knew it, her kids knew it, and Tim knew it. Whether it was something funny like milk in your nose, silly like dancing potholders in the kitchen, or even an accident on a hayride at 1 a.m., something unusual and not normal was par for the tootling Clement course. I guess for them, it was just about living life, trying to laugh and not taking yourself so seriously. At the end of the day—when teatime is over, Maryceleste can reflect on the lessons of her books. What if adults like Mr. Tootles and Ms Bea can have fun just like kids do? What if parents and kids can just cut up, play together and enjoy each other’s company? And, what if books really do influence the life of a child so that reading becomes the one gift no one can take away. Tootle Time Publishing Company and Paul Schexnayder seem to be the kind of almost-too-good-to-be-true collaboration. With their shared Louisiana roots and their appreciation for the excitement with which a child greets the day, they have created a family of characters that seem to dance off the pages. Paul Schexnayder was born in New Iberia, Louisiana, and much of his imagery is firmly rooted in the Acadiana (now known as Cajun) folklore of his early years. It was not until Paul went to college that he discovered his passion for drawing and painting and he continues to follow the mantra of his favorite professor: to draw every day. After college and a stint as a teacher in New England, he traveled to Guatemala and Mexico and was strongly influenced by the cultural expressions and the landscapes of the two countries. His work of the period reflects this exploration. Returning to Louisiana where he has lived and worked since 1993, he continues to be inspired by the stories of his native state. Schexnayder received his Bachelor of Fine Arts degree from Louisiana State University in 1988. He has shown in numerous group juried and solo shows in Paris, Boston, Houston and New Orleans. He is represented in galleries in New Iberia, Louisiana, and Galveston, Texas. Tea parties are a great way to get kids to communicate and socialize. Even the shy ones seem to come out of their shells. Birthday parties, going back to school, and ‘just because’ are all occasions for throwing a fun and whimsical tea party for children. Here are some tips for success! Make a whimsical invitation and include a pair of white gloves or faux pearls with the invitation. For boys, include a bowtie a la Mr. Tootles! If your tea party is for younger children, ask them to bring their favorite stuffed animal or doll with them. Keep the guest list to about 10 children around the same age. Decorate with balloons and a tea party piñata. Fill mini teapots with not-too-hot fruity teas. Have some juice on hand, too. Serve small finger sandwiches, petit fours and cookies. Don’t forget the peanut and jelly! Colorful napkins are a must. Have activities like coloring books and blowing bubbles available. And while all the tots are sipping their tea, read a Tootle Time tale! What messages do you want children to learn by reading your books? You and your husband run oil field company – how did you decide that you wanted to be an author? 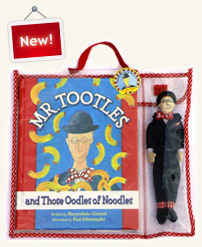 How did you and the illustrator Paul come up with the look of Mr. Tootles? Describe the collaborative process that you have with the illustrator? You have been doing readings to children for the past three years; tell us about some of your favorite moments with the children that come to these events. Tell us about the next books in the series? You have children of your own – how have you encouraged them to love reading? So many children do not like to read and there are so many distractions – like TV and video games. What can be done to change the attitudes of both children and adults about reading? You give a percentage of your sales to organizations to promote literacy…what do you hope this donation will do for reading and education in the U.S.?